First impressions can make or break success in the business world. High quality reception office furniture can accomplish for an office what a firm handshake does for a worker. Choosing the right reception furniture will reinforce your reputation and help your clients feel secure about doing business with you. We offer a wide range of reception furniture designed to fit your needs. Our inventory can accommodate a variety of reception area sizes, styles and decorative schemes. 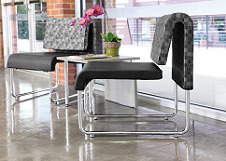 Contact us to learn more about the great waiting room furniture options including traditional and modern options with many waiting room chairs and desks to select from.